I’m experiencing some issue displaying the same PBR Rendering as SB Painter in Modo. 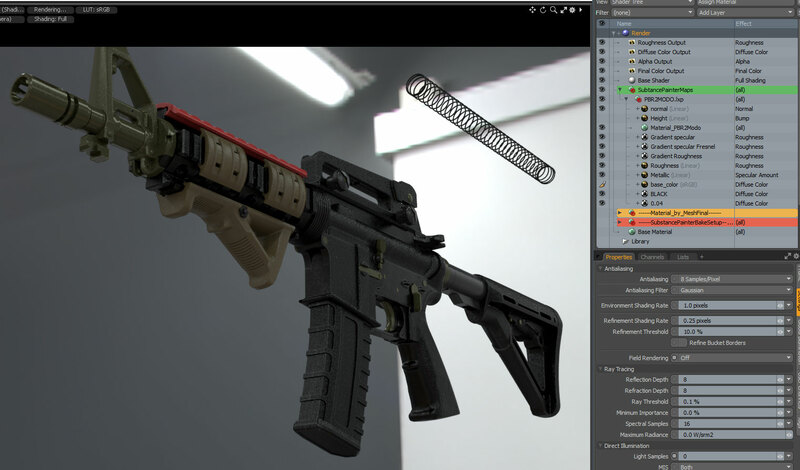 I’m looked into some forum thread like those from Wes McDermott here and some on modology.fr (Modo French User Forum), but didn’t found how figured out the same render in both software. So here i’m trying to find a workaround to this challenge. I’m probaly doing it in a wrong way but that is a good way to get involved with tools. 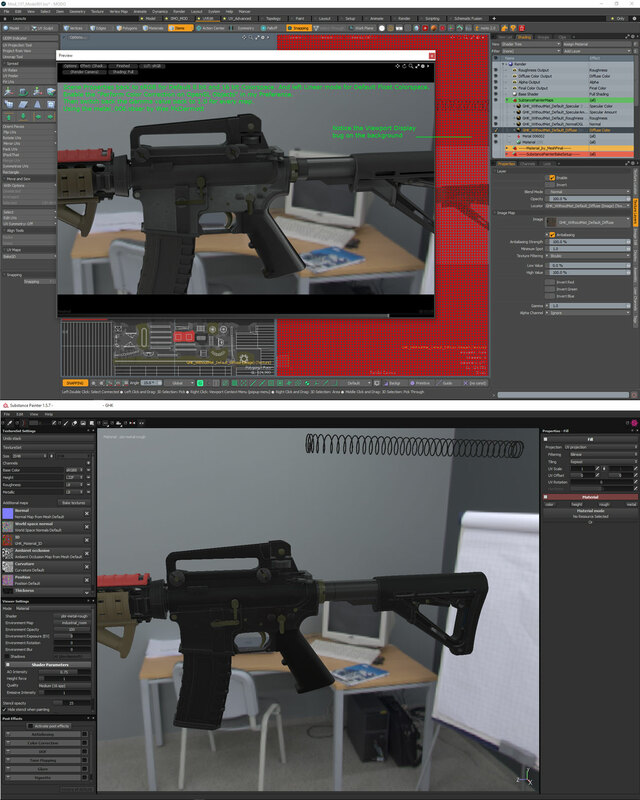 So feel free to comment on the original forum Allegorithmic. Setup both Software to Match the same result of Sub Painter viewport and Modo Render. 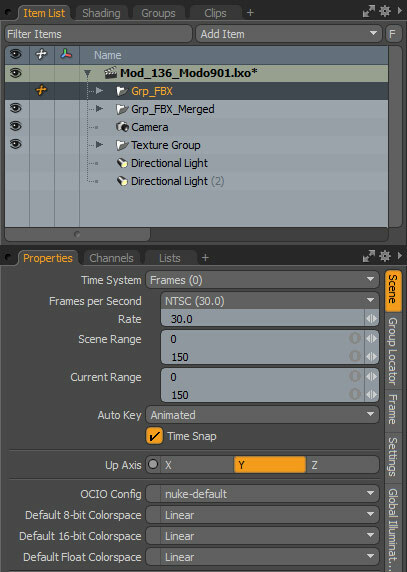 I’m runing Modo 901 SP3 with the last 2.1 Subtance Plugin. Also I’ve disable the « Perform Color Correction on OpenGL Objects » in Preference —> Display —> OpenGL —> Performance. Goal. Having no problem with the CIO (Color Input-Output Management) that still don’t work well between Viewport and Render when mixing Linear colorspace files (like all the Grey maps like Spec/Rough/Metalic) and sRGB Colorspace files (like DiffuseColor/SpecColor). 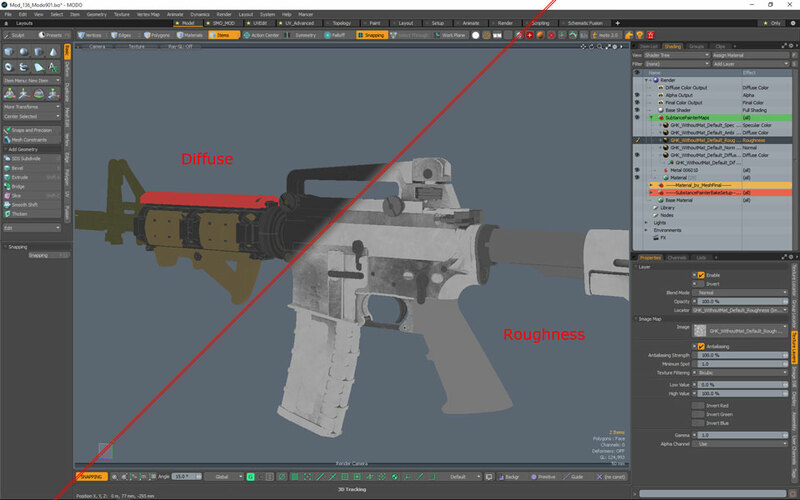 I’ve made that in order to load Roughness and Diffuse map directly as linear setup. and see them properly in terms of Colorspace in the Modo 3D Viewport as well as the one in SubPainter when you activate the color key to see the different maps. Here are the result showing in both application viewport. 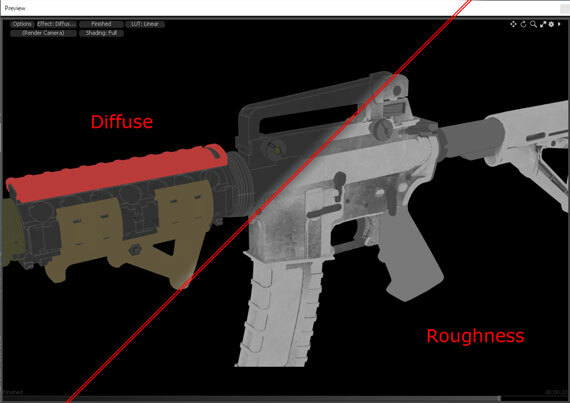 So Diffuse / SpecAmount(Metalic) and Roughness looks OK. But Normal are good too. The DiffuseColor / Roughness pass are ok tooked on side. but the Environment / Lighting looks a lot darker. How I can be sure to get the same result in both Modo and Sub Painter ? In order to fix that a bit, I’ve turned the Preview Render from Linear to sRGB Colorspace in order to get back the correct Gamma value for the Environement Background image and Lighting that come through. And also setup a Gamma value of 1/2.2 (=0.4546) to all my input texture maps. Now i’m close to the twice software, but there is still issue on the Metalic pass. I’ve turned back my settings to usual over the advice of Wes McDermott. Scene Properties back to sRGB for Default 8 bit and 16 bit Colorspace. And left Linear mode for Default Float Colorspace. Enable the « Perform Color Correction on OpenGL Objects » in my Preference. Then switch back the Gamma value back to 1.0 for every map. I’m using the metal_006.sbsar you’ve gave to our community in your main post (as well as in my first exemple). So at this 2nd try i got this just using the Normal / Diffuse and Roughness. When i want to use the Specular Color (through the Specular map from SbPainter) and Specular amount (through the Metalic map from SbPainter) it didn’t match. Actually it’s still buggy on the viewport making it imposible to work with. It’s due to the « Perform Color Correction on OpenGL Objects ». When it’s disable it works. When it’s enable it bugs… That’s why i didn’t like much that scene setup. I don’t know if that’s a Modo bug, but i will talk about that over their Forum for sure. Stay with Scene Properties to sRGB for Default 8 bit and 16 bit Colorspace and Linear mode for Default Float Colorspace. Here, don’t use the Sbsar file procedure quoted before. Just using basic traditional material properties of Modo. No Plugin needed. This solution look promising since there is still some issue on the other solution. Even if that’s not a straigh path from SbPainter to Modo, it’s the most flexible solution. 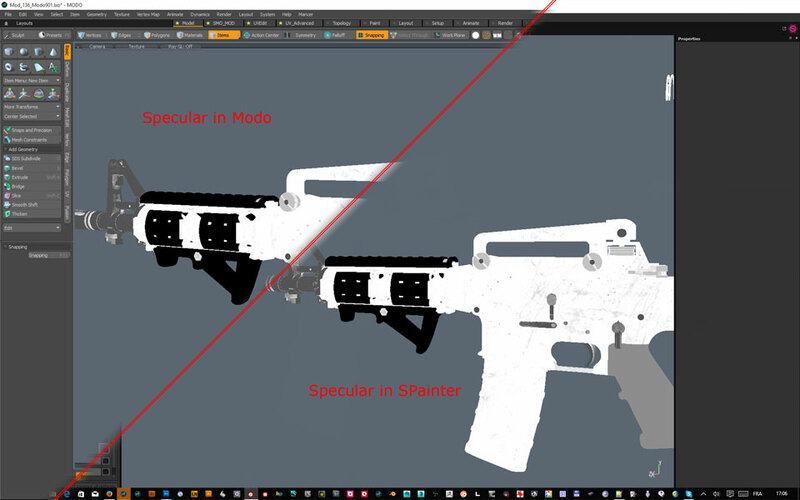 But Solution of Importing an Sbsar into Modo should be the best solution when workaround can fix the difference between SbPainter and Modo. Stay tuned for further update on that workflow. Cette entrée, publiée dans Art Graphic, Uncategorized, est taguée 3D, allegorithmic, CG, Gamma, Luxology, Modo, Painter, PBR, Substance, Substance Painter. Bookmarquez ce permalien.